Go Programming language is becoming popular in IoT sphere as well. I am very fascinated by Go powered robotics/IoT framework Gobot and planning to play with it using my RPi. This post explains how to install Go on Raspberry Pi. My RPi (2 Model B) shows it has ARMv7 processor. 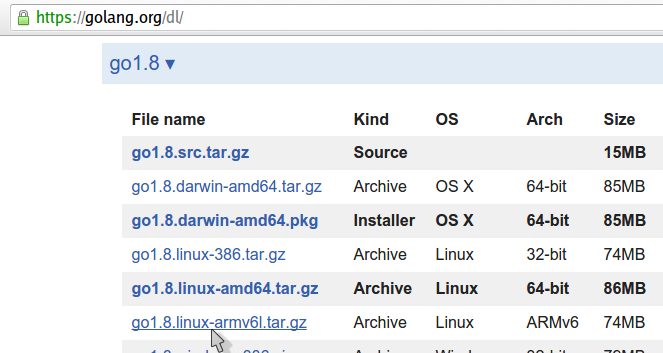 Go’s current stable version 1.8 has official ARMv6 build available for download Since ARMv7 compatible CPU can execute ARMv6 code, let’s download Go 1.8 ARMv6 build and install it. # Add /usr/local/go/bin to the PATH environment variable. # Above PATH setting will work when we re-login. Export it in current session as well. If all above steps worked fine, you will be able to execute go commands. Let’s check version. Sweet! Follow this guide to test the new installation by building ‘Hello World!’ program.